Bathroom design that works for most interiors with same marble finish for the bathtub and the floor, and walls in a contrasting shade of red. This classic and smart bathroom concept is all about bringing style and essence without going overboard. With the floors in a cream colored marble finish, the design features space for a spa and steam bath unit with a rack for storing the essentials. 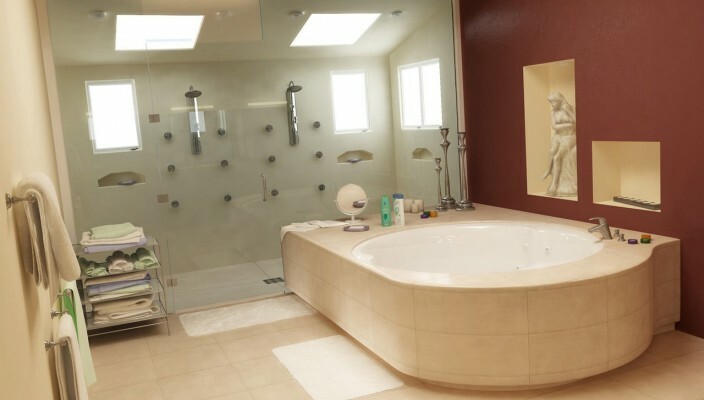 A large bathtub with similar marble finish has been added for more practical use of the space around. One of the walls has a red finish, while the opposite wall is in a contrast white finish. Simplistic appeal and use of marbled finish make this design a true appealing one in all respects with special attention to space.